The (cancelled) ISS Centrifuge Accommodations Module. Just wondering the specifics on this. I was unaware that any modules had been canceled. Was this module already being built. If so what happened to what was already built. 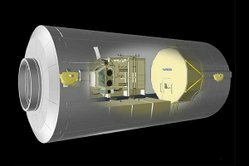 Re: The (cancelled) ISS Centrifuge Accommodations Module. Yes this was being built, the hardware ended up in a Japanese carpark. There were other canceled modules including the Habitation Module and various Russian modules. Might it of been premature to give up on this module on the Japeneses part, with the possibility of shuttle extension? No. As mentioned above, this module is on exhibit in a car slot near a JAXA building. It has been there for years. What is left of this module cannot be used for anything except for its current use in that car slot. I don't think that was the question. I think he asked if it was premature to put it that way so soon. Well, ok, fair enough. In any event, the CAM was cancelled long before the Columbia accident. Limited Shuttle flights wasn't a concern, money was as well as problems providing enough power to the CAM when in orbit etc. So is this considered NASA or JAXA property? I know it was being built for NASA by JAXA, but was wondering if JAXA maintained ownership due to it's cancellation. If it is NASA, I might need to get the Smithsonian to grab the module, seeing as the other ones intended for space are either there or in the case of the Hab being used for other purposes. Canceling the Russian solar tower made it hard to power the CAM. What the particulars were of the Japanese problems building the CAM, the Russian problems building the Tower and NASA wanting to save two shuttle flights could probably fill a book. As it was, not launching the CAM solved the problem for all three countries. If you take the cost of the Russian tower, the CAM, and two shuttle flights, they realized the CAM would have taken several billion dollars to get up and caused delays for everybody. Well you can't really have a Lunar or Mars base without this precursor science (among many other things including in situ fuel manufacturing if it is to be permanently staffed). It would cost $10-$100B to learn if wheat grows at Lunar/Mars G and to break and set and heal dog bones at Lunar/Mars G, right on the Moon and Mars. "Well, ok, fair enough. In any event, the CAM was cancelled long before the Columbia accident." From what I can tell Googling it was cancelled and restarted many times by GWB or whoever. At the time of Columbia, it was tentatively still a go if you use dated internet documents as proof. I'd welcome any clarification. CAM would've given us a guess as to the maximum safe crew rotation schedules at various potential manned bases in the Solar System. When CAM was killed, it was a victory for the future of robotics in space. You could say that's it for us as a species with CAM gone...might as well bash a toaster over my head now if the robots will control the space economy. Well, ok, fair enough. In any event, the CAM was cancelled long before the Columbia accident. The CAM flight disappeared from the manifest in spring 2001, when George Abbey's "surprise" $4.8 billion ISS overrun exploded in the face of the incoming Bush administration, and the administration responded by cutting ISS back to "US Core Complete". Everything after 10A disappeared from the manifest as well. But that was understood to be temporary, and that the flights could be restored after incoming administrator O'Keefe straightened out ISS' finances. And indeed the CAM was restored to the manifest as flight UF-7. After the Columbia accident and the VSE speech, NASA released a 28-flight manifest that completed ISS assembly by 2010, and the CAM was included on that manifest. The CAM flight was finally deleted for good after STS-114 when the problems with the PAL ramp caused a 1-year delay in the next flight, STS-121, and forced NASA to pare the 28-flight manifest down to 20 flights. I have a question. Were there 2 original designs for the CAM? When you search for pictures of it you see the very long module (similar length to Kibo), yet there are also pictures of a smaller module, maybe the size of an MPLM. Why is this? Not only is there plenty of time, it's not even clear to me that ISS is the right venue for such research. The CAM would have disrupted microgravity ops in the rest of the station and it was too small to carry humans. Research on small mammals (as was planned for CAM) will only answer so much. A separate variable-g facility large enough for humans would be needed after that, and ISS is definitely not the right place for it.